Abb. 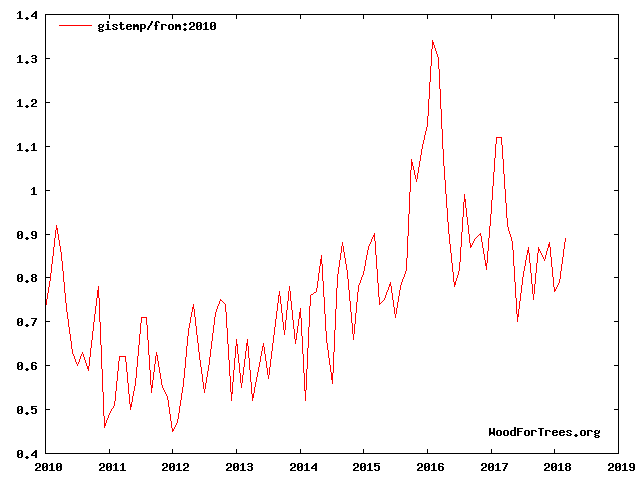 1: Globale Temperaturentwicklung seit 2010 laut GISS-Daten. Potzblitz: Der Artikel hat Recht. Das globale hat sich in den letzten 2 Jahren doch glatt um ein halbes Grad abgekühlt. Gute Nachrichten aus Amerika. Die Environmental Protection Agency (EPA) wird in Zukunft nur noch Daten verwenden, die öffentlich zur Verfügung gestellt werden. Das bedeutet das Aus für Privatdatensätze, deren Validität unüberprüfbar war. Ein guter Schritt hin zu mehr Transparenz und Reproduzierbarkeit. Im Hochland Boliviens sind Frauen für die Landwirtschaft verantwortlich. Ein großes Problem hier ist der Klimawandel, durch den nachhaltiger Anbau schwerer wird. Trotzdem schaffen die Frauen hohe Erträge. [...] Die Frauen in Tiraque bekommen den Klimawandel sehr deutlich mit. Die Durchschnittstemperaturen steigen, sagen sie. Die Regenzeit ist kürzer geworden und dauert nun nur noch zwei anstatt vier Monate. Deshalb kommt es zu Dürreperioden. Das Wetter sei insgesamt weniger gut vorhersehbar, außerdem gebe es nun sogar Hagelstürme und Überschwemmungen. Warum das so ist, erklären sie sich auf ganz unterschiedliche Weise. Eine sagt etwa, dass Pachamama, also Mutter Erde, müde geworden sei, andere glauben, dass die Sonne durch das Ozonloch so stark brenne, dass der Regen verdampfe, bevor er auf die Erde fallen kann. Wieder andere sehen in Autos, Asphalt und Fabriken außerhalb Boliviens die Gründe. Ganzen Artikel bei der Deutschen Welle lesen. Ammonium concentration in ice cores: A new proxy for regional temperature reconstruction? We present a reconstruction of tropical South American temperature anomalies over the last ∼1600 years. The reconstruction is based on a highly resolved and carefully dated ammonium record from an ice core that was drilled in 1999 on Nevado Illimani in the eastern Bolivian Andes. Concerning the relevant processes governing the observed correlation between ammonium concentrations and temperature anomalies, we discuss anthropogenic emissions, biomass burning, and precipitation changes but clearly favor a temperature‐dependent source strength of the vegetation in the Amazon Basin. That given, the reconstruction reveals that Medieval Warm Period– and Little Ice Age–type episodes are distinguishable in tropical South America, a region for which until now only very limited temperature proxy data have been available. For the time period from about 1050 to 1300 AD, our reconstruction shows relatively warm conditions that are followed by cooler conditions from the 15th to the 18th century, when temperatures dropped by up to 0.6°C below the 1961–1990 average. The last decades of the past millennium are characterized again by warm temperatures that seem to be unprecedented in the context of the last ∼1600 years. We statistically reconstruct austral summer (winter) surface air temperature fields back to ad 900 (1706) using 22 (20) annually resolved predictors from natural and human archives from southern South America (SSA). This represents the first regional-scale climate field reconstruction for parts of the Southern Hemisphere at this high temporal resolution. We apply three different reconstruction techniques: multivariate principal component regression, composite plus scaling, and regularized expectation maximization. There is generally good agreement between the results of the three methods on interannual and decadal timescales. The field reconstructions allow us to describe differences and similarities in the temperature evolution of different sub-regions of SSA. The reconstructed SSA mean summer temperatures between 900 and 1350 are mostly above the 1901–1995 climatology. After 1350, we reconstruct a sharp transition to colder conditions, which last until approximately 1700. The summers in the eighteenth century are relatively warm with a subsequent cold relapse peaking around 1850. In the twentieth century, summer temperatures reach conditions similar to earlier warm periods. The winter temperatures in the eighteenth and nineteenth centuries were mostly below the twentieth century average. The uncertainties of our reconstructions are generally largest in the eastern lowlands of SSA, where the coverage with proxy data is poorest. Verifications with independent summer temperature proxies and instrumental measurements suggest that the interannual and multi-decadal variations of SSA temperatures are well captured by our reconstructions. This new dataset can be used for data/model comparison and data assimilation as well as for detection and attribution studies at sub-continental scales.